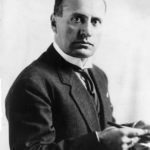 Benito Mussolini was an Italian politician, journalist and leader of the National Fascist Party ruling the country as Prime Minister from 1922 to 1943—constitutionally until 1925, when he dropped all pretense of democracy and set up a legal dictatorship. Known as Il Duce (“The Leader”), Mussolini was the founder of Italian Fascism. In 1912, Mussolini was a leading member of the National Directorate of the Italian Socialist Party (PSI), but was expelled from the PSI for advocating military intervention in World War I, in opposition to the party’s stance on neutrality. "War is to man what maternity is to a woman. From a philosophical and doctrinal viewpoint, I do not believe in perpetual peace." "War alone brings up to their highest tension all human energies and imposes the stamp of nobility upon the peoples who have the courage to make it." "It’s good to trust others but, not to do so is much better." "The history of saints is mainly the history of insane people."